Toru Takemitsu was born in Tokyo on 8 October 1930. He began attending the Keika Junior High School in 1943 and resolved to become a composer at the age of 16. During the post-war years, he came into contact with Western music through radio broadcasts by the American occupying forces – not only jazz, but especially classical music by Debussy and Copland and even by Schoenberg. He made his debut at the age of 20 with a piano piece Lento in Due Movimenti. Although Takemitsu was essentially a self-taught composer, he nevertheless sought contact with outstanding teachers: Toshi Ichiyanagi acquainted the composer with the European avant-garde of Messiaen, Nono und Stockhausen, and Fumio Hayasaka introduced Takemitsu to the world of film music and forged contacts to the film director Akira Kurosawa for whom Takemitsu produced several scores to film plots. 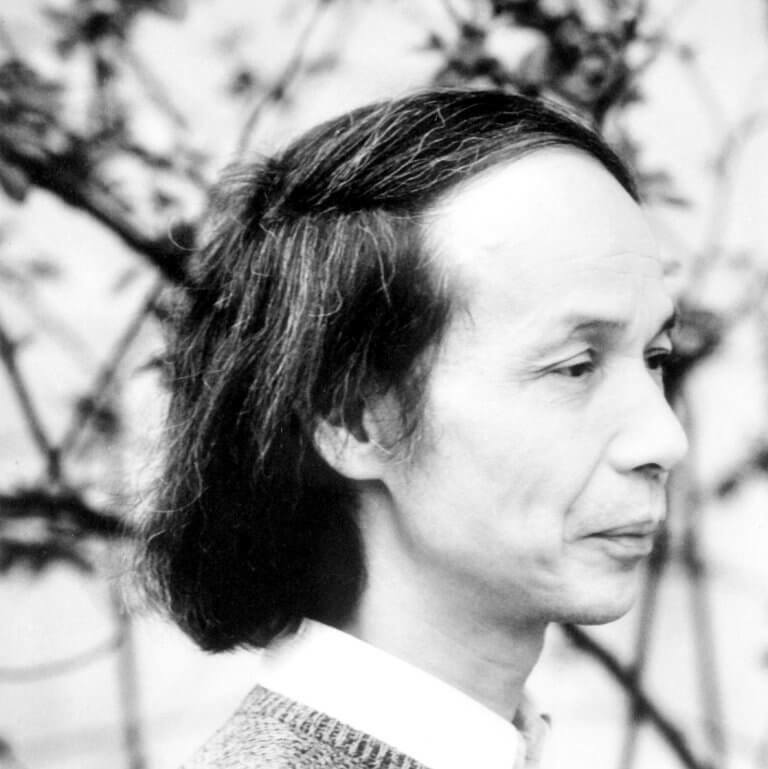 Alongside his musical studies, Takemitsu also took a great interest in other art forms including modern painting, theatre, film and literature (especially lyric poetry). His cultural-philosophical knowledge was acquired through a lively exchange of ideas with Yasuji Kiyose paired with his own personal experiences. In 1951, the group “Experimental Workshop” was co-founded by Takemitsu, other composers and representatives from a variety of artistic fields; this was a mixed media group whose avant-garde multimedia activities soon caused a sensation. Takemitsu taught composition at Yale University and received numerous invitations for visiting professorships from universities in the USA, Canada and Australia. He died in Tokyo on 20 February 1996. Peter Mussbach and the Berlin State Opera Unter den Linden commemorated Takemitsu in their staged project “My Way of Life” in 2004. Takemitsu’s earliest works display influences of Arnold Schoenberg and Alban Berg, whereas the compositions of his second creative phase reflect his preoccupation with French Impressionism, particularly Debussy. The composer gained initial recognition at the end of the 1950s with his Requiem for strings (1957) which incorporates serial techniques. Takemitsu’s interest in a wide variety of artistic expressive forms and his individual sense of freedom developed through his autodidacticism shaped the character of his avant-garde style. As early as 1950, he utilised a tape recorder to create musical collages from “real” sounds (“musique concrète”: Water Music, 1960; Kwaidan, 1964). In the early 1960s, two new elements appeared in Takemitsu’s works: on the one hand, traditional Japanese music (November Steps, 1967, for biwa, shakuhachi and orchestra) in the form of the deliberate juxtaposition of Eastern and Western musical culture and, on the other hand, the musical representation of natural phenomena (ARCI for orchestra, 1963-1966). Representations of the art of Japanese gardens through the utilisation of symbolic musical metaphors are frequently encountered in his compositions (A Flock Descends into the Pentagonal Garden for orchestra, 1977). Although Takemitsu’s artistically most ambitious works are focused on the genres orchestral and chamber music, the composer also displays great interest in popular music including jazz, pop and French chansons. He composed around a hundred film scores (Dodes’ka-Den, 1996). His 12 Songs for Guitar (1977), containing passages with arrangements of world-famous pop classics (including songs by the Beatles), demonstrate Takemitsu’s affinity with the broader musical tastes generated by the hyper-cultural influences of a media-dominated world. Takemitsu was the recipient of numerous awards and prizes including the Prix Italia, first prize at the Festival of Contemporary Music in Karuisawa (both in 1958), the German Consulate prize at the Tokyo Contemporary Music Festival (1960 and 1961), the major prize at the Japanese Art Festival (1966), the Otaka Prize (1976 and 1981) and the Los Angeles Film Critics Award (for the film “Ran”, 1987), the UNESCO-IMC Music Prize (1991), the Grawemeyer Award for Music Composition (1994) and the Glenn Gould Prize (1996). Takemitsu was composer-in-residence at the Canberra Festival of Musica Viva in Australia (1960), at the London Music Digest (1973) and the Evenings for New Music at the State University of New York in Buffalo (1977). In 1979, he was appointed as an honorary member of the Academy of Arts in the German Democratic Republic, a member of the American Academy of Arts and Letters in 1984, a member of the Ordre des arts et des letters in 1985 and in 1994 as a member of the Royal Academy of Music in London.